I will admit that recently I've developed an obsession for bodycare and basically I've realised that I'm searching for the best body products that are easy to apply, highly effective and required minimal effort. I really have no motivation when it comes to moisturising my lower half. 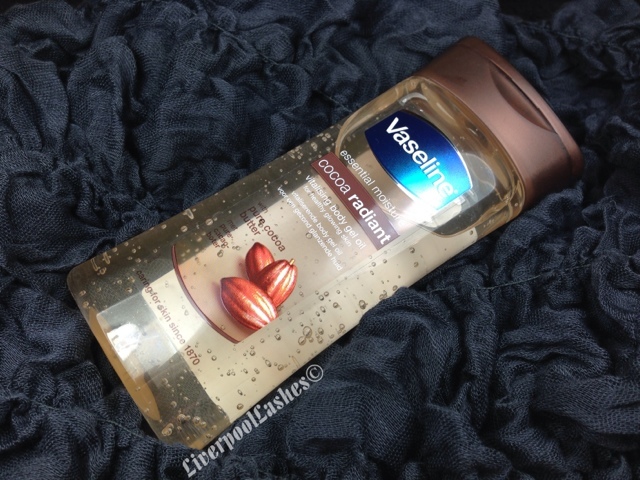 For a long time I've been spying the Vaseline Cocoa Radiant Vitalising Gel Body Oil, there's something about the bubbles in the bottle that have always attracted me. I really wanted the Aloe version but it seems that Boots no longer stock and other places seem to only have the Cocoa Radiant version. "When skin is healthy, light reflects off the rich colour below the surface, giving it an amazing natural glow. Daily showers can strip the natural protecting oils from your skin allowing moisture to evaporate. Cocoa butter fragrance vitalising gel body oil, used after bathing, replenishes skin and locks in moisture for naturally radiant skin"
As soon as I tried this product I was delighted. For the past few months I've been enjoying body oils but I must admit I apply them in a carpeted bedroom as I'm petrified of slipping over as most of my bottles are pour ones and I am terrible for chucking it all over with no precision. This is what makes the Vaseline Cocoa Radiant Vitalising Gel Body Oil so amazing. As it's a gel consistency its a precise application, no mess at all. It definitely feels like it locks in moisture and leaves a sheen to the skin which would look amazing on your legs in the summer. The bottom line is... I adore this stuff. I really think that this would suit most people apart from those with sensitive skin as it may be a little too fragranced. I would even go as far as to say that to me this is a 'must' for my beauty stash as it truly makes my skin feel amazing. I highly recommend that you check this one out ! I am also on the look out for good body moisturizers. Have you tried The Body Shop butters? Those are pretty amazing as well. Have to keep my eye open for this product when I finish my current bottle of lotion.